Welcome to my fourth blog about this unique, holistic and positive method of working and bonding with your animal friends. 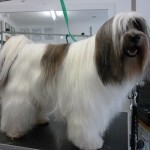 My name is Caroline Still and I am a local dog groomer and T-Touch Practitioner for companion animals. The noise of fireworks can be incredibly upsetting for some animals, and many owners fear firework season. 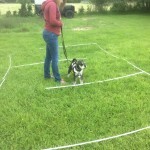 Finding an area on your dog to calm and reassure can be beneficial, this is often around the chest area. Using slow circular strokes, with a very light touch might be enough to focus the animal, even just for a brief moment, so it can relax even if just for two seconds. Ear work – stroking the dog’s ear from base to top, slowly and lightly can be very beneficial. Using Thundershirts© and touch methods combined can produce positive results.